The Nano is Beretta's most recent entry into the world of micro-compact self-defense 9mm handguns. Introduced in by Beretta in 2011, the Nano is designed to compete in the micro 9 market with brands and models such as the Kahr PM9, Ruger LC9S, and now the Glock 43. The Nano is a polymer framed, striker fired handgun that was specifically designed for CCW and concealment. The Nano features a snag-free design with beveled edges and is not equipped with a slide release or safety. According to Beretta, the Nano does comes equipped with an internal automatic striker block and drop safety. The Nano comes with a 6-round magazine for a max capacity of 6+1 and features an ambidextrous magazine release. With the standard 6 round magazine, the grip on the Nano is what you would expect with a pistol of this size, and most shooters will find that at least their pinky hangs off the grip. If you have abnormally larger hands, then there’s a good chance that two fingers will be hanging off the grip of the Nano. However, based on customer requests, Beretta has finally introduced an extended magazine for the Nano that carries 8 rounds and features a “plus one” pinky extension. Current Nano models ship with 1 flush mounted 6 round magazine and an 8 round extended magazine. The Nano trigger pull has received mixed reviews with some professional gun writers calling is excessively long and heavy, while others have reported that it breaks as expected for a striker fired gun of this size. Most reviewers had the trigger breaking at 7-8 pounds, which isn’t at all bad for a double action only striker fired pistol. 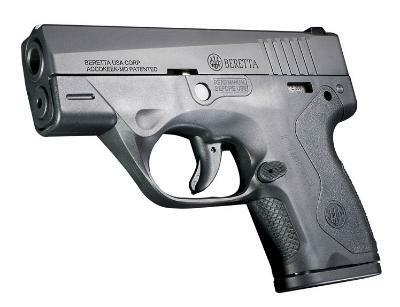 Beretta originally planned on releasing the .40 caliber version of the Nano to the market first but changed plans and opted to offer the 9mm version first. Beretta appears to have canceled the plans to offer the Nano is a .40 caliber model, as, currently, the Nano is only available in a 9mm version. As the 9mm version has a snappy, yet manageable recoil, the .40 caliber model would push the limits of comfortable shooting. Similar to the Sig P250/P320 series of pistols, the Nano is designed with a sub-chassis frame which means other frames and grips can be added to the Nano frame later. Currently, Beretta offers frames in black, dark earth, olive drab, and pink. The standard Nano comes equipped with low profile 3 dot sights, which can be removed and upgraded. When the first Nano models were introduced to the market, there were complaints about failure to eject (FTE), especially with 9mm ammunition loaded with any bullet weight of 123 grains or less. Supposedly, Beretta addressed this issue in later generations of the Nano by slightly reducing the recoil springs. However, as the Nano is built to accept standard ammo as well as +P rounds, Beretta suggests that the Nano performs best when running ammo with a bullet weight of 124 grains or more. #1 – I have a Beretta Nano with a Crimson Trace laser mounted. Do you offer a holster to fit that set-up? We do offer holsters made to fit the Beretta Nano with a Crimson Trace LG-483 LaserGuard laser mounted, and any holster listed below will meet that requirement. #2 – I removed the stock sights on my Nano and replaced them with Dawson Precision Fiber Optic sights, which look higher (taller) than the stock sights. Will the holsters that you make for the Beretta Nano fit those sights? While the Dawson Precision Fiber Optic sights are slightly higher than the stock Beretta Nano sights, we haven’t had any issues with the slightly taller sights not fitting our holsters. #3 – I bought a Nano that came equipped with a LaserMax Centerfire laser. Do you have a holster to fit that? Yes, most any holster that we carry below is available in a version to fit a Beretta Nano with a LaserMax Centerfire laser mounted to it. #4 – Do you offer, or can you make a Beretta Nano pocket holster? #5 - Do you have a holster to fit a Beretta Nano with a laser? The answer will depend on the specific laser model that you have, but we should be able to help. As previously mentioned, we do offer holsters to fit the Beretta Nano with a Crimson Trace laser or a LaserMax laser mounted. #6 – Can you suggest a good Beretta Nano appendix holster for appendix IWB? #7 – I’m looking for a Beretta Nano paddle holster? Do you have anything, and can I get it with a retention strap? Listed below are the current Beretta Nano holster models that we carry.